Glaring into the camera with fierce determination, covered with scars and struggling to break her chains, Olympic medallist and five-time undisputed World Amateur Boxing champion Mangte Chungneijang Mary Kom is featured in a striking new ad from People for the Ethical Treatment of Animals (PETA) India, just in time for the Ganesh Chaturthi festival. 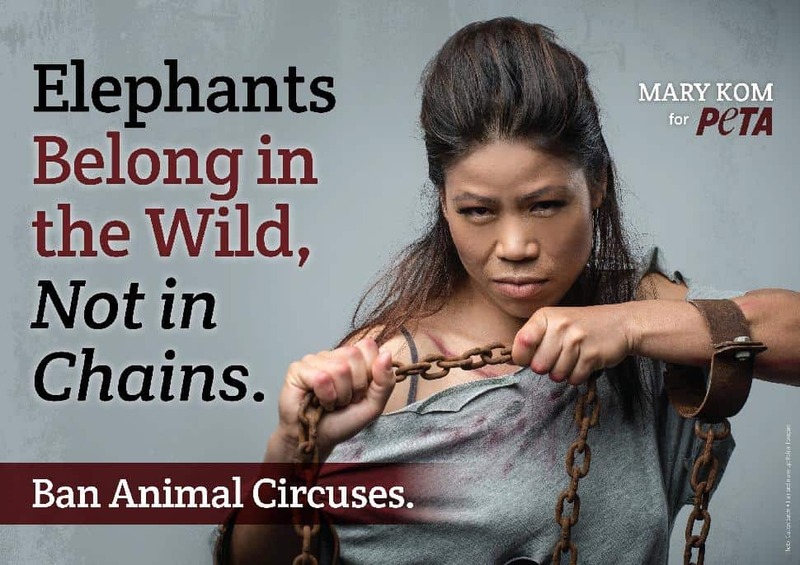 The ad's caption reads, "Elephants Belong in the Wild, Not in Chains. Ban Animal Circuses". "Circuses are cruel places for animals, where they are beaten and tortured,” said Kom. “As a mother, I can imagine what animals go through when their children are taken away from them to be forced to perform in circuses. It's sad. We humans choose to perform, but animals are given no choice." Elephants and other animals in circuses are subjected to chronic confinement, physical abuse and psychological torment. Whips and other weapons – including ankuses, which resemble fireplace pokers with a hook on one end – are often used to inflict pain on elephants and beat them into submission. Following a nine-month investigation of circuses by a team that included representatives from PETA India and its sister organisation Animal Rahat, the Animal Welfare Board of India, a statutory body operating under the Ministry of Environment & Forests, decided to stop the registration of elephants used to perform in circuses. However, this decision has yet to be implemented. Kom, who is from Manipur, has received numerous awards, including the Padma Bhushan, the Rajiv Gandhi Khel Ratna and the Padmashree. "Magnificent Mary", as she has been dubbed, was named Sportswoman of the Year in 2010 at the Sahara India Sports Awards and is India's most successful female athlete of all time.